Download "To launch the Microsoft Excel program, locate the Microsoft Excel icon, and double click." 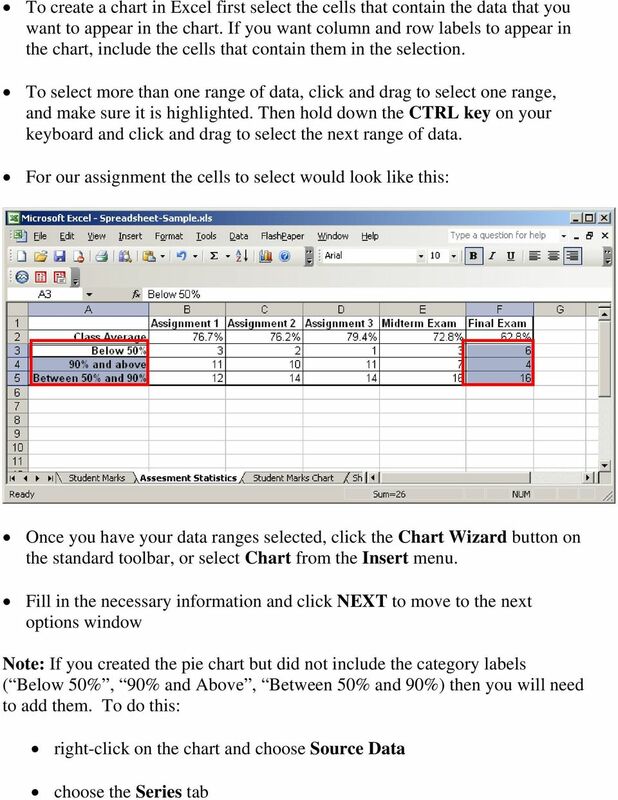 1 EDIT202 Spreadsheet Lab Assignment Guidelines Getting Started 1. 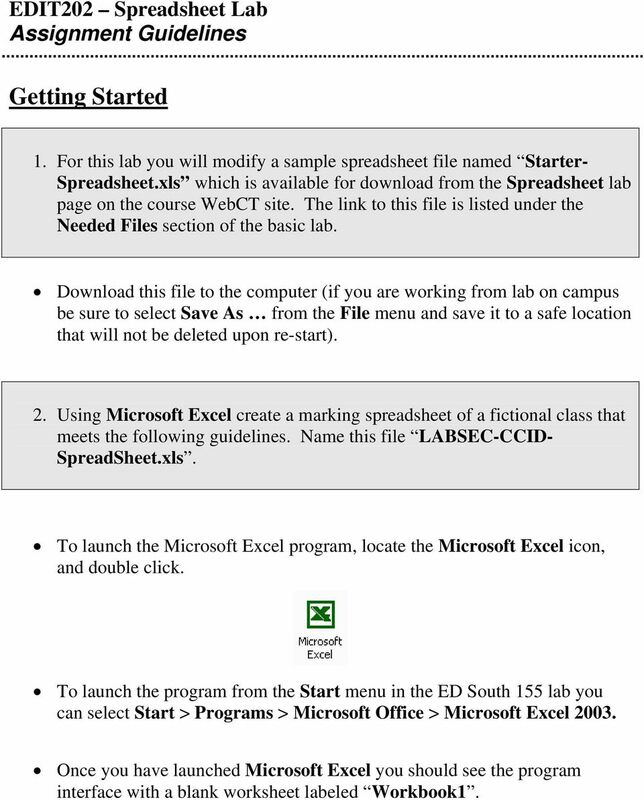 For this lab you will modify a sample spreadsheet file named Starter- Spreadsheet.xls which is available for download from the Spreadsheet lab page on the course WebCT site. The link to this file is listed under the Needed Files section of the basic lab. Download this file to the computer (if you are working from lab on campus be sure to select Save As from the File menu and save it to a safe location that will not be deleted upon re-start). 2. 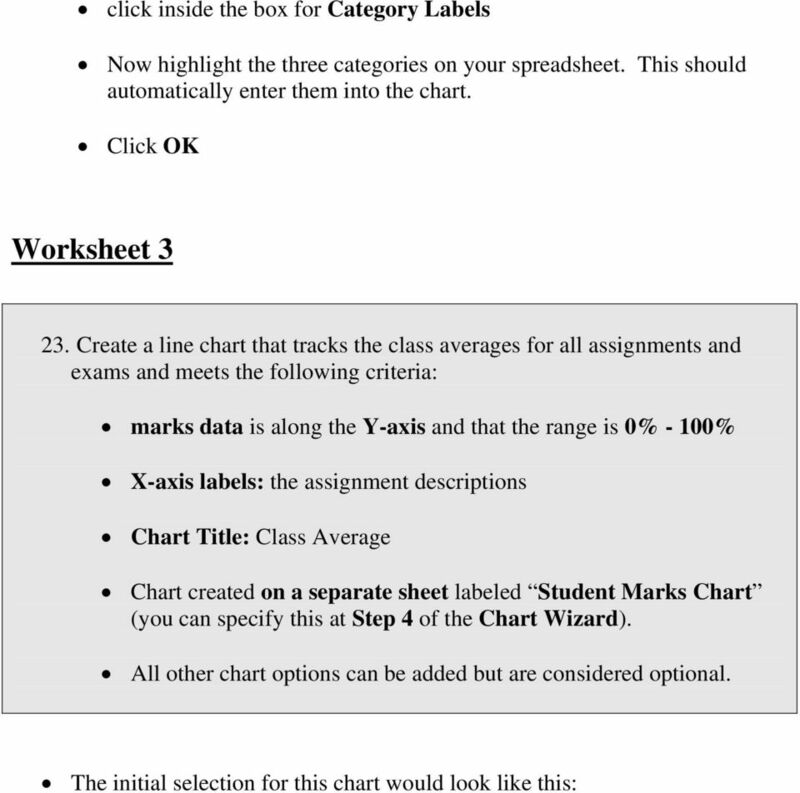 Using Microsoft Excel create a marking spreadsheet of a fictional class that meets the following guidelines. Name this file LABSEC-CCID- SpreadSheet.xls. To launch the Microsoft Excel program, locate the Microsoft Excel icon, and double click. 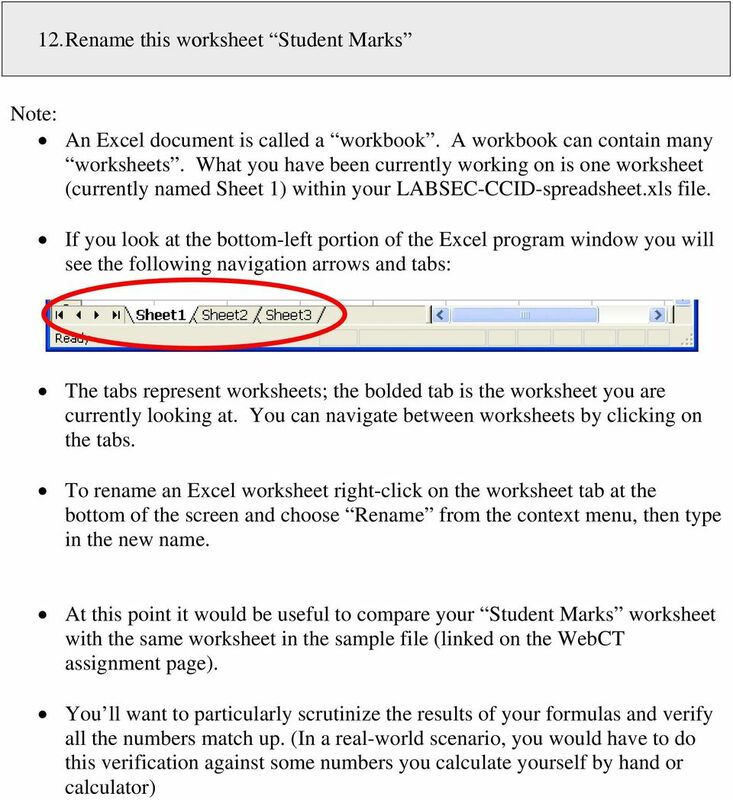 To launch the program from the Start menu in the ED South 155 lab you can select Start > Programs > Microsoft Office > Microsoft Excel Once you have launched Microsoft Excel you should see the program interface with a blank worksheet labeled Workbook1. 2 Choose File > Open, then browse for the saved sample spreadsheet that was downloaded from the course WebCT site. 3. You will need to make sure that the following toolbars are available in order to be able to complete all of the steps in the tutorial: Standard, Formatting, and Drawing Using the View menu choose Toolbars check of the name of a toolbar to add it to view. Worksheet 1 4. 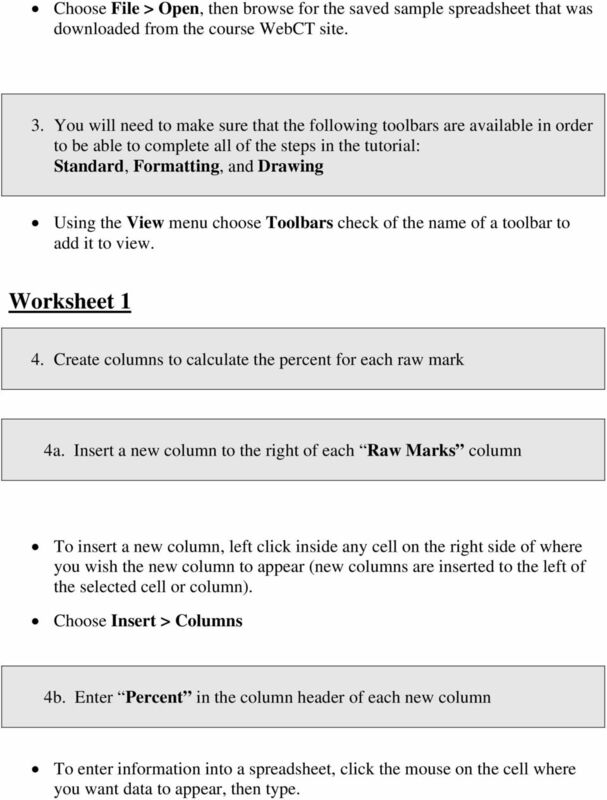 Create columns to calculate the percent for each raw mark 4a. Insert a new column to the right of each Raw Marks column To insert a new column, left click inside any cell on the right side of where you wish the new column to appear (new columns are inserted to the left of the selected cell or column). Choose Insert > Columns 4b. Enter Percent in the column header of each new column To enter information into a spreadsheet, click the mouse on the cell where you want data to appear, then type. 4 reference is automatically entered into the formula. (This means when you are done your formula hit enter on the keyboard instead of clicking on another cell.) A relative cell reference is automatically adjusted when copying a formula to other cells. 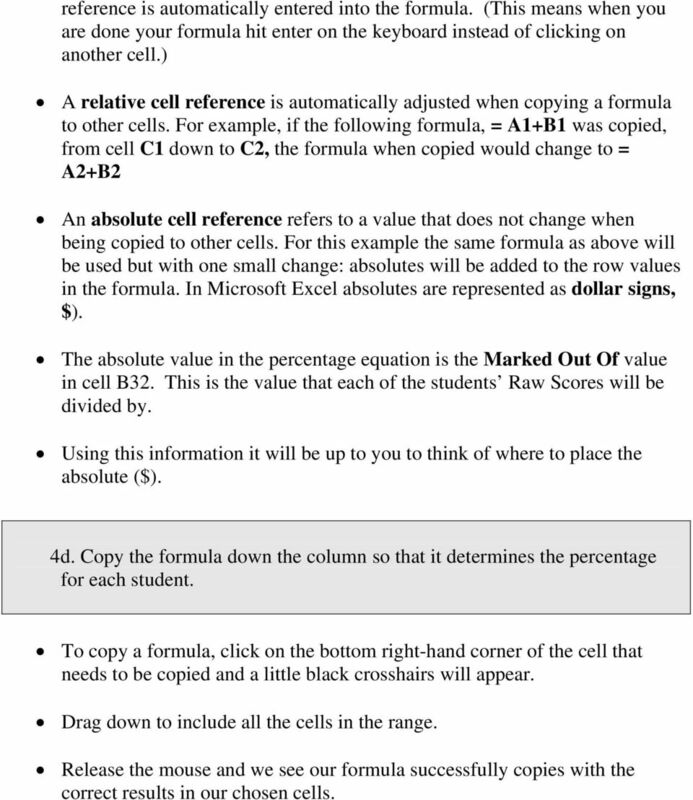 For example, if the following formula, = A1+B1 was copied, from cell C1 down to C2, the formula when copied would change to = A2+B2 An absolute cell reference refers to a value that does not change when being copied to other cells. For this example the same formula as above will be used but with one small change: absolutes will be added to the row values in the formula. In Microsoft Excel absolutes are represented as dollar signs, $). The absolute value in the percentage equation is the Marked Out Of value in cell B32. This is the value that each of the students Raw Scores will be divided by. Using this information it will be up to you to think of where to place the absolute ($). 4d. 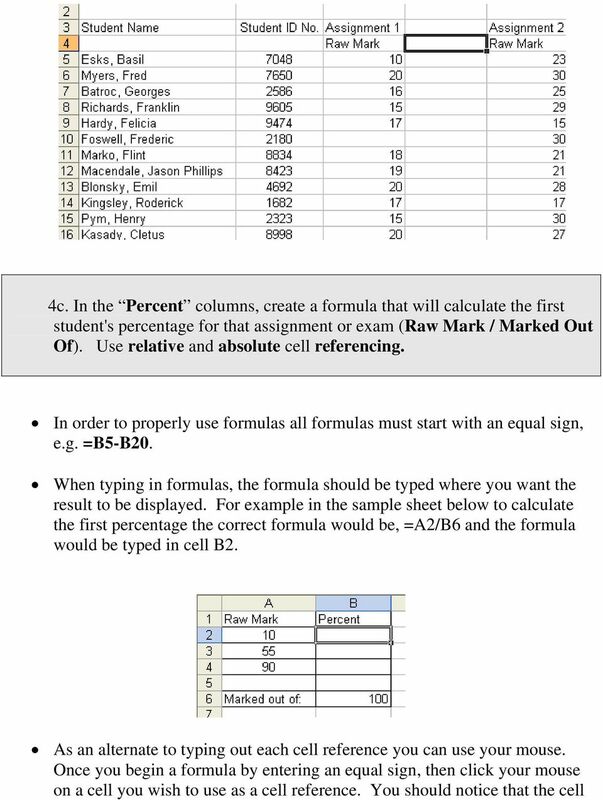 Copy the formula down the column so that it determines the percentage for each student. To copy a formula, click on the bottom right-hand corner of the cell that needs to be copied and a little black crosshairs will appear. Drag down to include all the cells in the range. Release the mouse and we see our formula successfully copies with the correct results in our chosen cells. 5 4e. 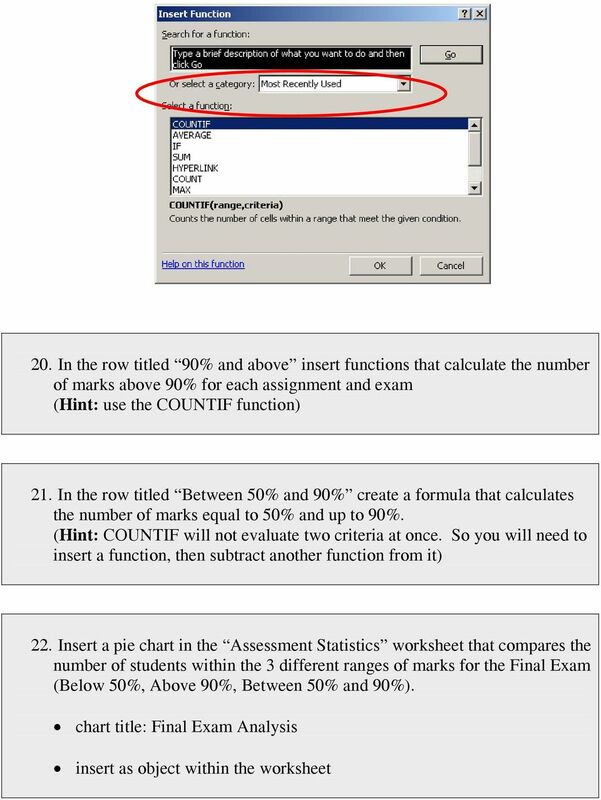 Format each students percentage to be displayed in percent format and to include one decimal place (e.g. 65.4% not 0.654). To get all of the numbers on your spreadsheet displayed in a consistent manner, such as an equal number of decimal places, you need to set a number formatting option. To do this, first highlight the whole block of cells you want to format. 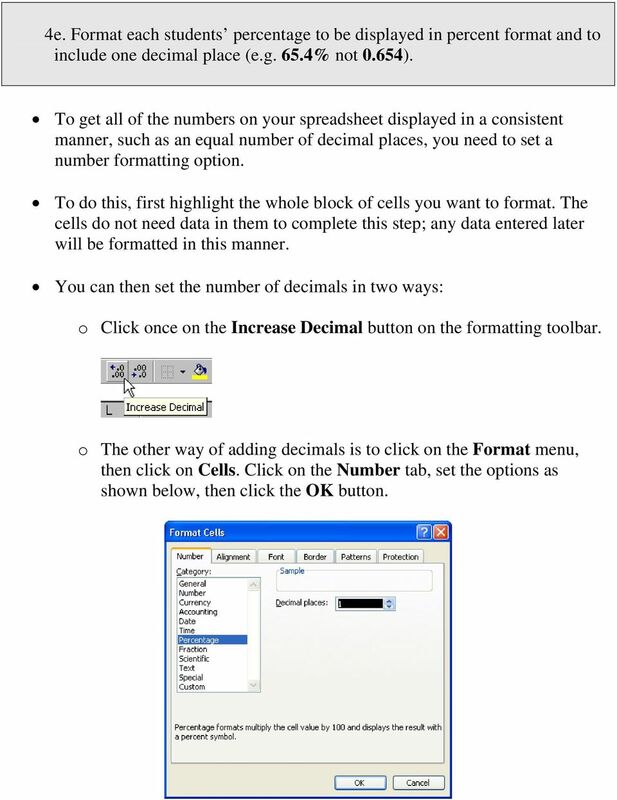 The cells do not need data in them to complete this step; any data entered later will be formatted in this manner. You can then set the number of decimals in two ways: o Click once on the Increase Decimal button on the formatting toolbar. o The other way of adding decimals is to click on the Format menu, then click on Cells. Click on the Number tab, set the options as shown below, then click the OK button. 7 If you have never used functions within Excel, it is recommended at this point that you go to the Functions section of your Prep Sheet read up on them. To insert a function into a cell, click on the cell, then select Function from the Insert menu. This opens the Insert Function window. Choose the desired function, and click OK. If you can t find the function you are looking for select the All category and you will see all functions listed in alphabetical order. Your current assignment also makes use of the "IF" function, specifically to determine whether or not students will receive honors. 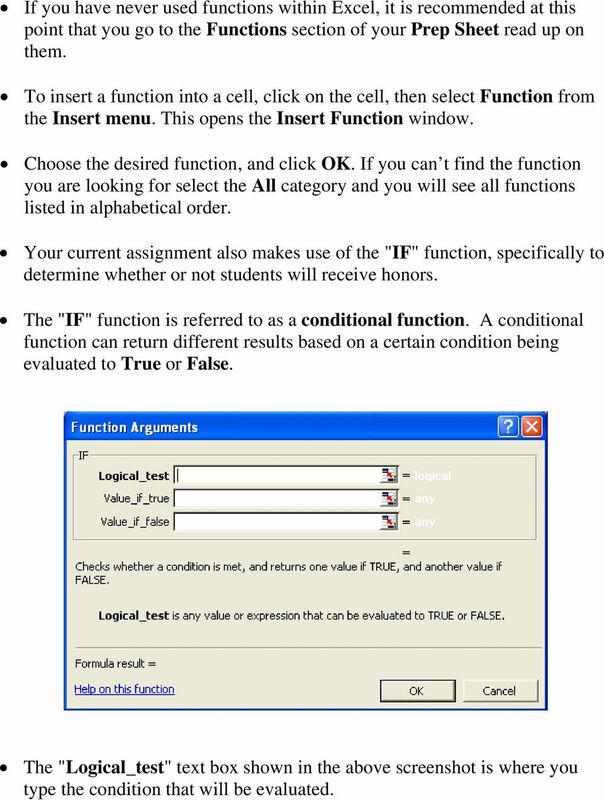 The "IF" function is referred to as a conditional function. A conditional function can return different results based on a certain condition being evaluated to True or False. The "Logical_test" text box shown in the above screenshot is where you type the condition that will be evaluated. 8 So if that condition proves to be True we can get it to return a certain result, and if that condition proves to be False then we can get it to return a different result. NOTE: The following is an example of using the IF function. Refer to step 6b in the grey box above for the criteria you should use in this assignment. What is being tested in the example (please note this is only an example and will differ that what is needed for your assignment) shown below is whether or not the value in cell A5 is greater than 10 by typing "A5>10" in the "Logical_test" text box. So on the spreadsheet the phrase, "Yes the number in A5 is more than 10", would appear in the cell we selected before opening the function wizard. 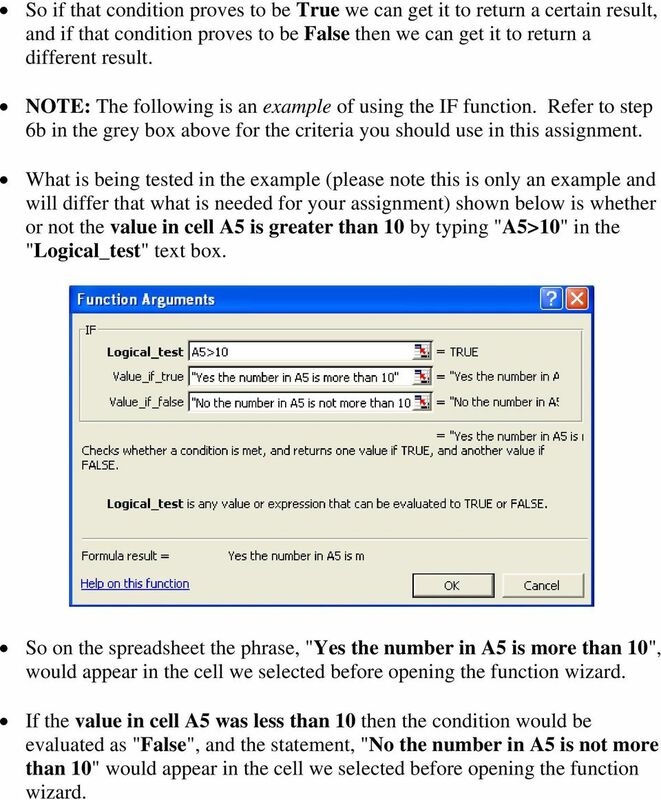 If the value in cell A5 was less than 10 then the condition would be evaluated as "False", and the statement, "No the number in A5 is not more than 10" would appear in the cell we selected before opening the function wizard. 9 7. Sort the students on your spreadsheet in ascending according to their ID number. (Note: be sure that the students data gets sorted along with the ID numbers, otherwise you will mix up which marks go with which student) First, indicate which data in the spreadsheet is to be sorted. Select the range of data you want to sort, making sure that all the data you want to move as a result of the sort has been selected. Select Sort from the Data menu. The Sort options window appears. Choose either Header row or No header row, based on whether or not you included the column headings when you selected your sort data. 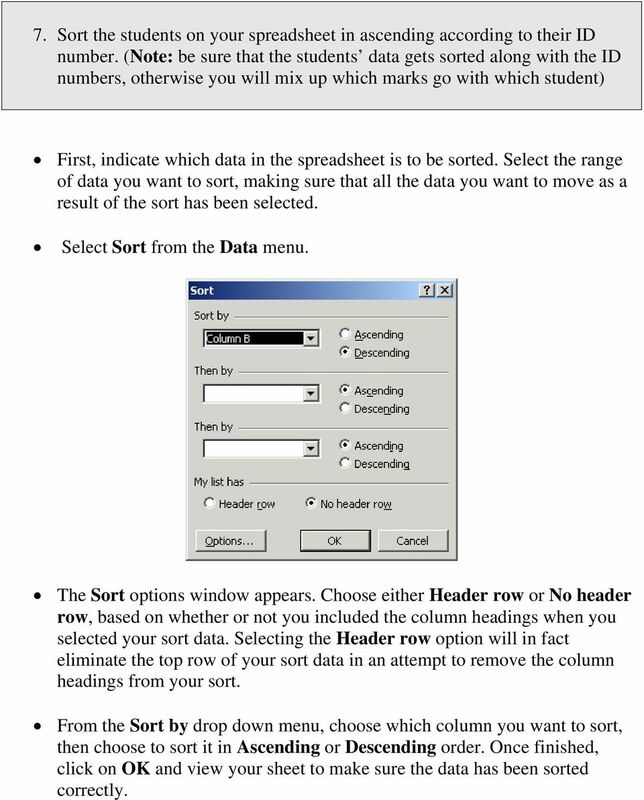 Selecting the Header row option will in fact eliminate the top row of your sort data in an attempt to remove the column headings from your sort. From the Sort by drop down menu, choose which column you want to sort, then choose to sort it in Ascending or Descending order. Once finished, click on OK and view your sheet to make sure the data has been sorted correctly. 10 8. Bold the main title and change the font and size to Arial 24. Merge and Center the title across all of the columns containing data in the spreadsheet. 9. 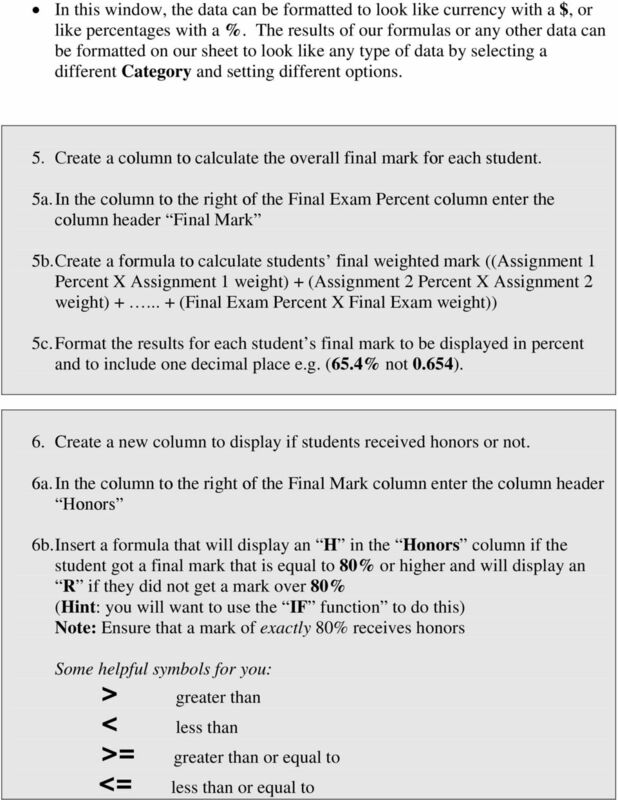 Bold the individual column headings as well, and merge and center them across the two columns for each assignment and exam (raw mark and percent). 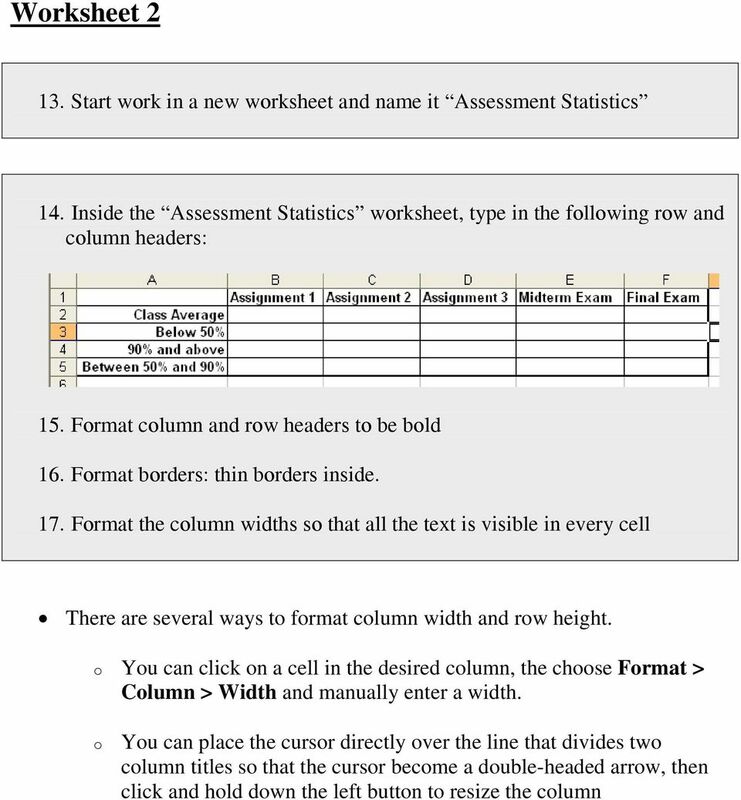 To format the data on your sheet there are a few different options. First, select the cell or range of cells you want to format. You can use the available buttons on the formatting toolbar. You can also select Cells from the Format menu then select the Font tab to change the font size, style, or color. There are many more options when you use Format Cells, however using the formatting toolbar is quicker and more convenient. Merging cells is where you take a range of cells and merge them together as if they are one cell. An example of merged cells is shown below. Cells A1 through G1 of a sheet are merged (treated as if they were one cell), and the text is also centered within this larger cell area. 11 To merge data we first need to select the cells we want to merge. Start by clicking on the cell which contains the content you wish to keep. Then continue selected the range of cells you wish to merge into one. 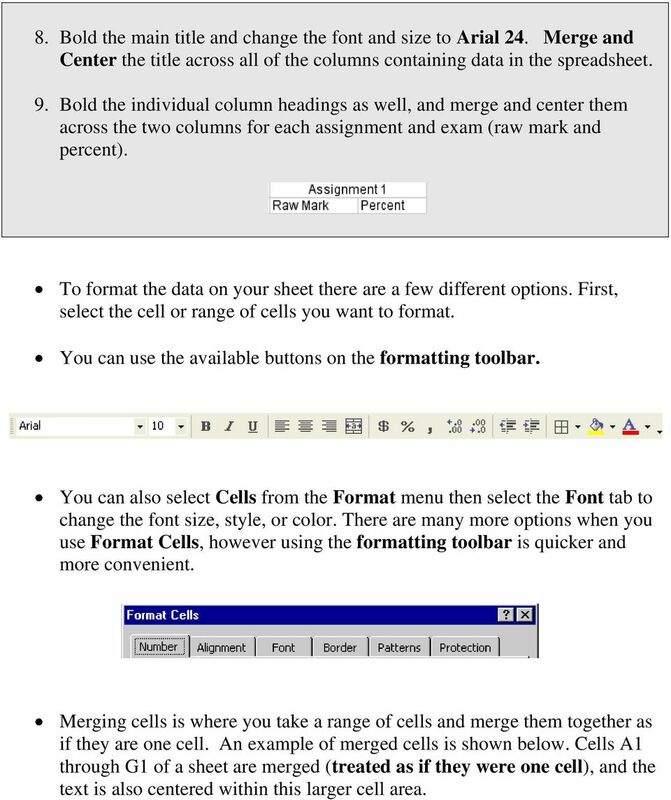 Then with the cells highlighted, use the Merge and Center button found on the formatting toolbar. 10. 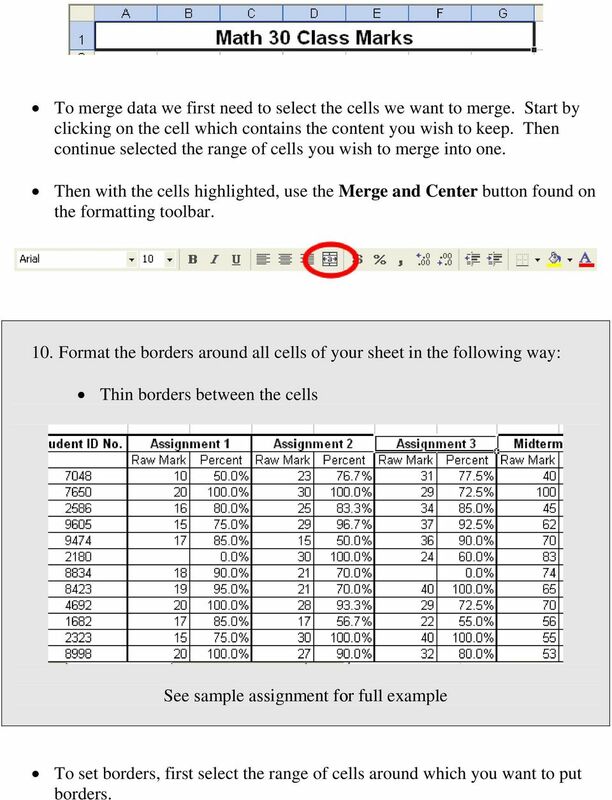 Format the borders around all cells of your sheet in the following way: Thin borders between the cells See sample assignment for full example To set borders, first select the range of cells around which you want to put borders. 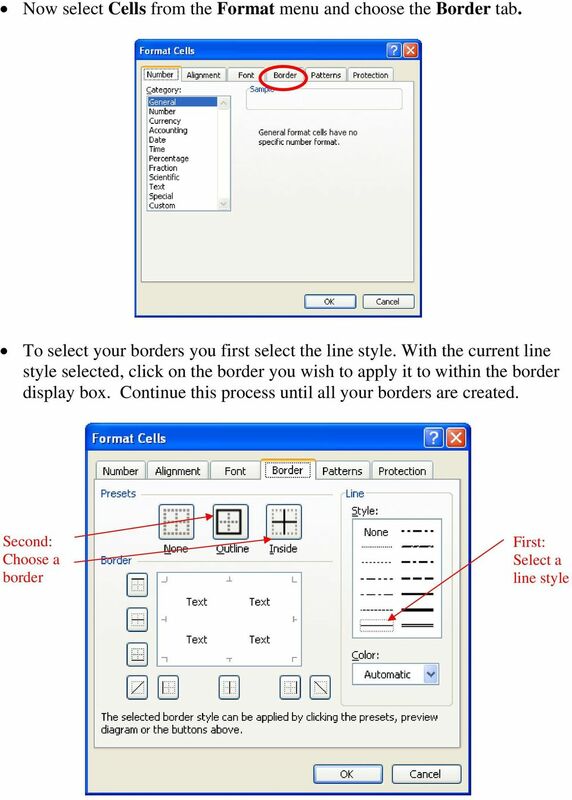 13 Select the range of cells you wish to format and then select Cells from the Format menu then select the Patterns tab to change the background color of a cell. 11. Insert Cell Comments (as listed below in ) into the following cells Cell C3 (Assignment 1): Statistics Project Cell E3 (Assignment 2): Finance Project Cell G3 (Assignment 3): Design Project Cell N3 (Honors): H = honors R = regular Honors is awarded to a final mark of 80% or higher To add a comment to a cell, click in the cell to which you want to add the comment and select Comment from the Insert menu. In the comment box, type your comment text. When you finish typing the text you can single click on the edge of the box to place it in a different location. When you are happy with the placement, single click outside the comment box. Wherever the comment box is placed will be where it will appear when you drag your mouse over the cell that has the comment. 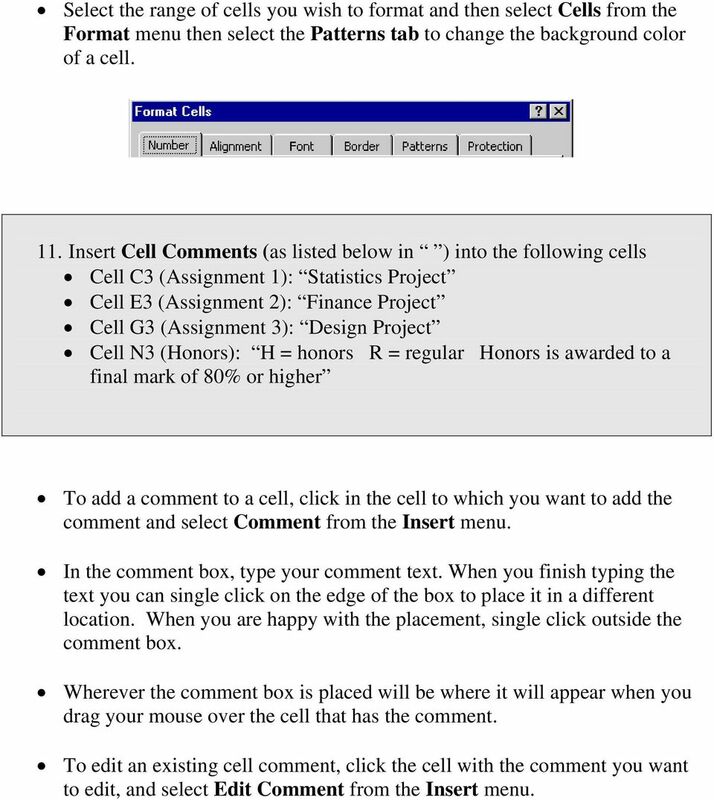 To edit an existing cell comment, click the cell with the comment you want to edit, and select Edit Comment from the Insert menu. 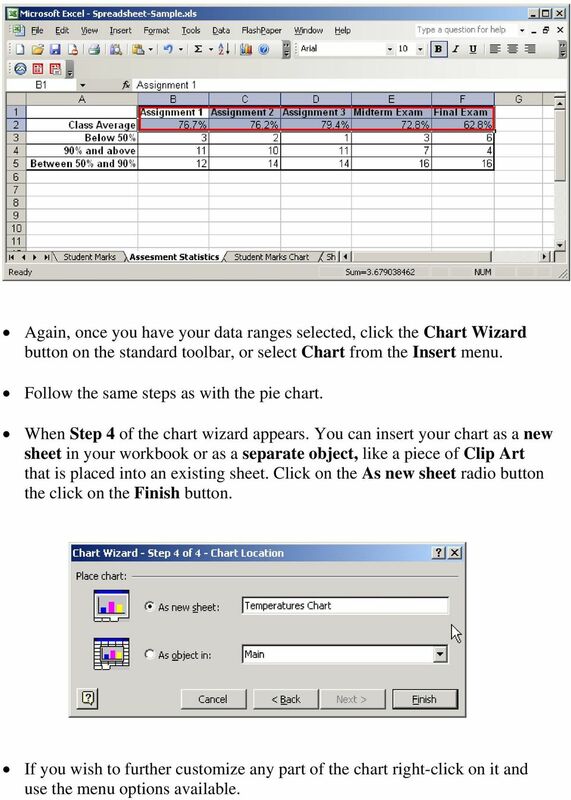 20 Again, once you have your data ranges selected, click the Chart Wizard button on the standard toolbar, or select Chart from the Insert menu. Follow the same steps as with the pie chart. When Step 4 of the chart wizard appears. You can insert your chart as a new sheet in your workbook or as a separate object, like a piece of Clip Art that is placed into an existing sheet. Click on the As new sheet radio button the click on the Finish button. If you wish to further customize any part of the chart right-click on it and use the menu options available. 21 For example you will want to change the range of the Y-axis to be 0%- 100%. To do this: o Right-click anywhere among the percents displayed in the X-axis. o The Format Axis window appears. Choose the Scale tab and make your changes. Cell Protection 24. 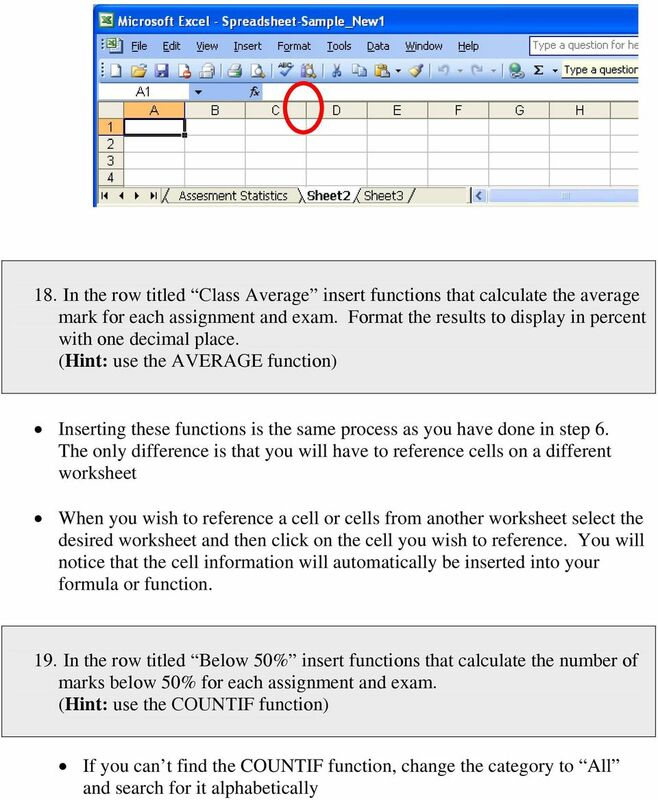 Modify your Student Marks worksheet so that only the cells with Raw Data (ie. Student Name, Student ID, Raw Marks for all assignments and exams) can be modified or have data entered into them when the sheet is protected. First select the ranges of data on the sheet you want to be able to edit after the entire worksheet has been protected. Select Cells from the Format menu. The Format Cells window should appear. Click on the Protection tab. Click in the box next to Locked to remove the check mark. Click OK. You have now set the Locked property for these cells to false. In other words you have unlocked these cells. 22 Our next step is to protect our entire worksheet. From the Tools menu select Protection > Protect Sheet. The Protect Sheet window appears. Leave the options as they are and click OK. This ensures that every object on your sheet, aside from the ranges of cells you unlocked, will be unchangeable after the sheet has been protected. To protect other objects or set options on your sheet, single click to add a checkmark in the above check boxes. You also have the option to assign a password. This way only the people that know the password will be able to unprotect the worksheet and make changes. However, if you are ever submitting a spreadsheet for marking you do not want to set a password. The person marking your sheet will need to unprotect it in order mark it. Now if you try to alter the contents of any of the locked cells, you will not be able to. You should, however, be able to modify the data in the unlocked cells. If you want to change the locked property of cells, the worksheet must be unprotected. Thus, once you have protected a sheet, you must unprotect it before you can modify the locked settings or any other settings. Microsoft Excel 3 Advanced-Level Features of Excel 2013 Revision 0 (12-12-2013) Advanced Conditional Formatting Using Formulas See the Conditional Formatting tab in the Excel 3 Practice.xls spreadsheet.